A terrible accident. A killer among friends. A woman risking everything for answers. 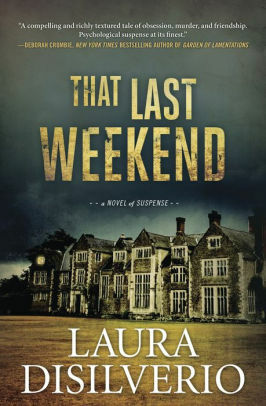 Ten years later, Laurel Muir returns to the castle for the first time since the accident, hoping to reconnect with her friends and lay the past to rest. When a murderer attacks, it rips open old wounds and forces the women to admit there’s a killer in their midst. The remaining friends make a pact to unearth the truth, but suspicion, doubt, and old secrets threaten to tear them apart. Unsure who to trust, Laurel puts herself in harm’s way, risking it all for friendship and long-delayed justice. This novel is well plotted, its mystery compelling, and its outcome unexpected. A compelling and richly textured tale of obsession, murder, and friendship. Psychological suspense at its finest. DiSilverio’s signature easy-to-follow plotting draws readers in.